Operation Crayweed: restoring Sydney's underwater forests. Sydney Australia used to have a rich coastline teeming with life, and crayweed (Phyllospora comosa) stretched far and wide. Crayweed is a brown macroalga that forms dense bushy habitat for a variety of marine life. Sometime back in the 80s, crayweed largely disappeared, and much of the inhabitants with it. While the cause of the crayweed reduction was unclear, many point to prolonged poor water quality. The water quality in Sydney has improved, but the crayweed didn’t bounce back as expected. Thus enters Operation Crayweed, an effort to restore the natural population of crayweed around Sydney. The group settles crayweed onto mats, then divers deploy and secure the mats so the crayweed can naturally spread. A recent study titled ”Polar lipid profile of Saccharina latissima, a functional food from the sea” was just published in the journal, Algal Research. Saccharina latissima is a brown alga (kelp). It is known by the common name sugar kelp, and also sea belt or Devil's apron, due to its shape. Sugar kelp grows relatively fast and large (about 5 meters, or 16 feet long), and its ability to be grown on a long line also makes it an appealing species for near shore cultivation. Indeed sugar kelp farms have been on the rise within the USA. Blooming 3D-jelly cakes made from seaweed sugars. If you haven’t heard of a blooming 3D cake, make sure you check out the video or link below. These cakes are built upside down into a jelly cake to create beautiful, edible, works of art. A recent article highlighted Siew Heng Boon of Jelly Alchemy , who makes her cakes from algae-based gelatin rather than sourced from animals, this makes her cakes vegan friendly. These cakes look amazing and incredibly fun to make. The video below shows how they are made. From the makers of the seaweed surfboard, comes Triton flip-flops: sandals made from algae! Flip-flops are the number one shoe in the world, and many are made from polymers that don’t break down, causing more pollution in our landfills and oceans. Triton flip-flops are made from algae and are completely compostable. These alternative materials can help companies and consumers wane off disposable plastics. Algae derived materials are growing in form and function and we expect that trend to continue. Watch the video below about this new amazing product. Farm bill passes that dramatically expands federal support for algae agriculture! Today a landmark farm bill has been approved by the U.S senate. The bill places algal farming as a top concern for the country and gives algal farmers some of the privileges that traditional farmers have always had. Biobased Markets Program (BioPreferred)– Directs USDA to establish methodology providing full credit for biobased content for products from biologically recycled carbon. Current USDA methodology excludes biobased products from recycled carbon. This is a big win for algae and the USA! The bill is to cross president trumps desk for a final signature before Christmas. Whole Foods predicts uptick in seaweed snacks in 2019. What the heck is seaweed anyway? Sometimes we take our phycological education for granted and forget that algal terminology can be a bit confusing. Let’s review some basic concepts to ensure that we are all on the same page when thinking about seaweed. A very brief overview of the evolution of photosynthetic organisms. In the beginning there was a bacterium that learned a neat trick. This bacterium contained pigments that allowed it to capture sunlight and convert it into energy via photosynthesis. The bacterium was engulfed and incorporated by another single celled organism (a eukaryote), this event is called primary endosymbiosis. Its a partnership between the two cells (bacterium and eukaryote) similar to the photosynthetic algae that like inside corals. Through this process red, and then later green, algae came into existence. 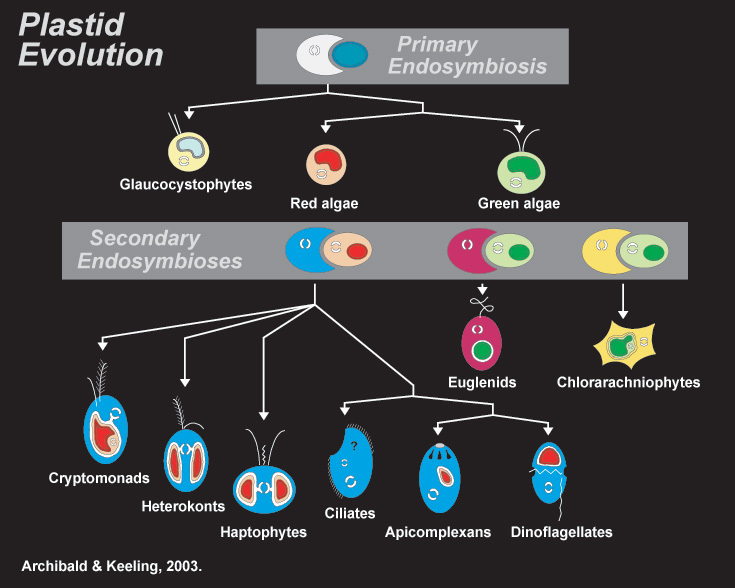 After this primary endosymbiotic union, secondary and even tertiary endosymbioses occurred - algal cells themselves getting engulfed and incorporated to give rise to other algal groups including macroalgae, browns, and terrestrial plants. If you want to dive into the specifics of how scientists discovered this, here is a good paper outlining how the genetic code of algae lead to the discovery. It may seem a little complicated, and in fact it is, its very complicated. But it is super cool and for this reason we don’t like algae being called plants; it’s like calling “fish” … “humans.” On a more humorous note, we do encourage people to call plants, “land-adapted algae”. Again, check out algaebase.org to review all of this and see where your favorite seaweed fits in. Image of Mazzaella laminarioides by M. Graham. We’ve lost count of how many times we’ve been asked about carrageenan and it’s ability to cause cancer. Controversy swirls around this molecule and it’s easy enough to google ‘carrageenan’ to find calls for banning its use. For those of you unwilling to read the entire post, let us summarize that carrageenan does not cause cancer! Like any good conspiracy theory, the claim is built off of a grain of truth. A study referencing the wrong molecule exaggerated it’s effects and became sensationalized by the media. That study has been refuted numerous times by a variety of academic and government agencies. However, the damage was done, and the internet is a very unforgiving place for misguided information. We will review the uses, definitions, and conflicting studies behind this controversy. Carrageenan is a component of some red seaweeds most notably Chondrus crispus, also known as Irish moss. The molecule itself is a sugar, a polysaccharide to be exact. There are a variety of carrageenans that are described by their bonding configuration and molecular weights (Mw). These varieties, like most molecules, can take their shape through chemical processing to fulfill different functions. Typically, carrageenan refers to the sugar used in the food industry (Mw 200k-800k Da) as a thickening agent, and can be found in many common household items. The sugar is also non-digestible to humans (stay tuned for upcoming post) making it a sought after additive for low calorie sweets treats. Irish moss has been harvested for over 14,000 years for human consumption, and carrageenan has been used as a thickening agent since at least the 19th century. Where is the grain of truth? Dr. Joanne K. Tobacman is the most cited reference in carrageenan attacks. In 2001, she published a review of carrageenan and it’s effects on health in the journal of Environmental Health Perspectives. She cited a study from 1982 that linked degraded carrageenan (also known as carrageenan gum or poligeenan Mw 20k-40k Da) to cancer in lab animals. In her review she also cited a number of papers investigating degraded carrageenan causing intestinal inflammation leading to ulcers and lesions. In her paper, Dr. Tobacman suggested that the use of carrageenan be reviewed by the FDA and change the restrictions to the molecular weight requirements as a food additive. It turns out that the term carrageenan was misused in the previous studies. Dr. Myra L. Weiner published a paper refuting Dr. Tobacman in 2016 in the journal of Food and Chemical Toxicology called ‘Parameters and pitfalls to consider in the conduct of food additive research, Carrageenan as a case study’. Dr. Weiner’s followup paper in 2017 again stated the importance of defining the molecule in question and illustrated the root of the issue in regards to carrageenan. Dr. Weiner laid out the argument that previous studies misused the name carrageenan by confusing degraded carrageenan and poligeenan with non-degraded carrageenan, lacking fundamental understanding of physical/chemical and toxicological properties. Non-degraded carrageenan is used as a food additive, while degraded carrageenan and poligeenan are not. The process to degrade carrageenan requires high heat (95C) and acid (<1pH) which neither occur within the human body. Weiner concluded that the non-degraded form of carrageenan, typically refereed to simply as carrageenan, was perfectly safe for food use and it has continued to be used to this day. The FDA supports carrageenan use and classifies it as meeting organic standards. The EU has also re-evaluated carrageenan as safe, with a clear banning of poligeenan defined by molecular weights. However, there is still pressure to remove the sugar from commercial products. There are still hundreds of ‘nutrition/ health’ articles out there sounding alarm bells to not use products containing carrageenan. We certainly understand the importance of understanding the food you are consuming, and it’s a shame that some companies have caused such distrust among consumers. There has been so much positive change recently to correct this consumer trust, but there is still a long way to go. The wealth of information on the internet is daunting and confusing when it comes to nutrition. We have embedded all the links to the actual publications and government reports within this post. You can read the letter from the FDA to Tobacman rejecting her petition to ban carrageenan. TAKE HOME MESSAGE: The production of carrageenan is in fact another safe and positive reason to support the rise of seaweed farming in the US and globally. If you hear otherwise, you are probably reading an article recycling the misinformation described above. Always check with your source …. Do you have a question about seaweed, do you ask a phycologist or an algologist? It’s tempting to simply add ‘ology’ to the end of a word when referring to the study of a subject. For that reason many people often refer to a person who studies algae as an algologist. The true meaning of algologist is ‘one who studies pain’. From the Latin root word algos meaning pain. The correct term for the study of algae is phycology, from the Latin root phycos meaning seaweed. The use of the term algology, as the study of algae, is so prevalent that most dictionaries will define it as ‘the study of algae: see phycology’. To make matters worse I have seen algology defined simply as phycology. AlgaeBase: One of the best algae resources available! Have you ever gone to your favorite sushi spot and ordered a side seaweed salad made of wakame? While the connotation is that wakame refers to the intertdial species Undaria pinnatifida, the literal translation from Japanese is ‘seaweed’. An alga’s common name can vary by region and language while the scientific name is a global standard. These scientific or ‘Latin’ names can change over time as new discoveries appear; this was the case in the early 2000s with the leaps made in genetic sequencing technologies. If you ever want to know the history of an alga’s Latin name, or know the common name in any part of the world, look no further. AlgaeBase.org is by far one of the best algae resources available to the public. On AlgaeBase you can look up common names of algae and find all names ever associated with it. You can also find other species information such as ecology, images, global distribution, and common uses. Each bit of information is linked to a vetted document, typically a peer-reviewed journal. Take a minute and visit the site. Poke around and look up some of your favorite seaweeds, you might be surprised with what you find.